NOTE: As the manufacturer adds new models this adapter may fit additional models not listed above. Click here for the most current model information or contact us by clicking here. NOTE: Manufacturer features can change without notice. Please visit the manufacturer's website for the latest product information. Dimensions: Approximately 6.5 inches in overall length when totally extended. Click on individual links to view more information. Included Suction Cup Base: RAP-B-224-1U rubber suction cup base is designed to have an extra strong hold on any smooth non-porous surface such as glass surfaces. 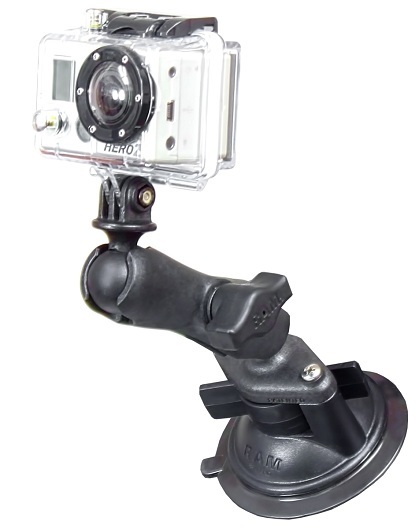 3.25 inch rubber suction cup base with twist on/off lock allows for easy removal and precise placement of the suction cup mount. Included Arm: RAP-B-201U black composite standard sized length arm for 1 inch balls. Measures 3.0 inches between socket centers. Measures 3.6875 inches in overall total length. The arm allows for easy adjustment by loosening the plastic side knob, a single spring inside the arm opens the sockets, allowing the arm to pivot on the attached base accessory. This enables the arm and accessories to be positioned at various angles allowing the ultimate in position flexibility. Loosen the knob completely and the arm will disconnect from the accessories. Included GoPro Adapter: RAP-B-202U-GOP1 composite adapter with 1 inch rubber ball. Click here to see installation instructions for the RAM-B-166 series.